Back your favorite football teams with championship-worthy party decor. Table cover is constructed from light-medium weight plastic, measures 54-inch wide x 102-inch long and is designed to fit standard rectangle shaped banquet tables up to 8 feet in length. 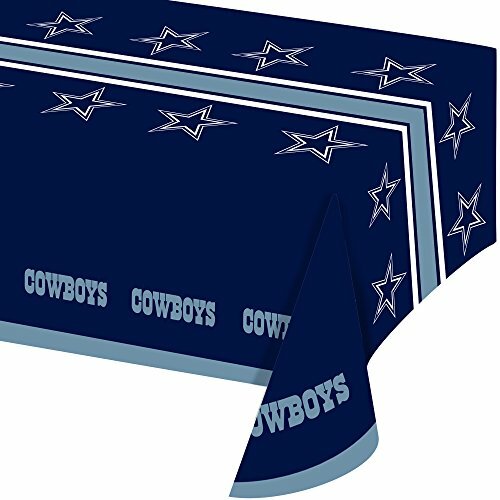 Tablecloth has football themed team logo print and team name on the top and edges. Creatively convert your gameday gatherings into the biggest events of the year. Support the team and your party with coordinated NFL football party supplies including paper plates, napkins, plastic cups and plastic tablecloths. Just the ticket for hosting a tailgating or house party that generates just as much excitement as the game itself. With over 80 years of combined experience in the paper and party goods industry, creative converting has successfully transformed game-watching get togethers, college graduations and sports fan's birthdays in every state into unforgettable memories and commemorations with a complete offering of premium strength disposable paper tableware, coordinating decor and fun accessory items. Creative converting can more than accommodate all your party and event needs. If you have any questions about this product by Creative Converting, contact us by completing and submitting the form below. If you are looking for a specif part number, please include it with your message.